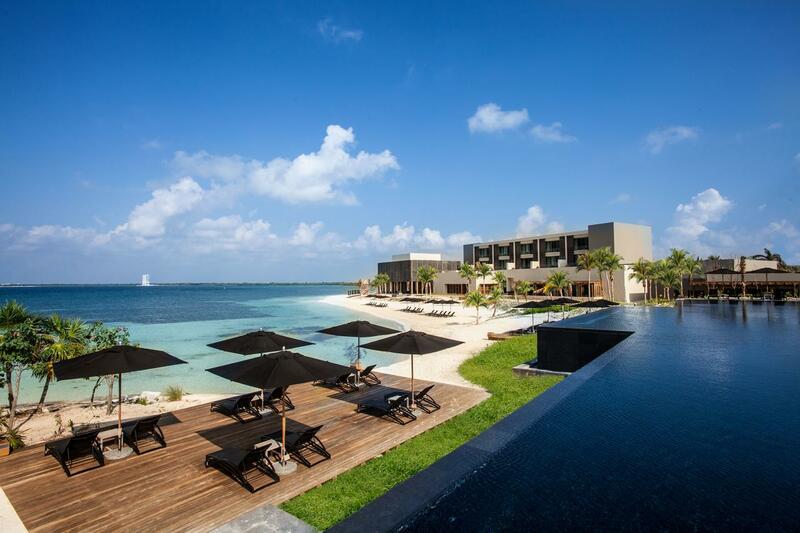 The Riviera Maya has come back in vogue with the luxury jet-set after a short hiatus. in recent years, over-tourism of the area by predominantly american, all-inclusive vacationers has left the trend-setting luxe traveller looking elsewhere. 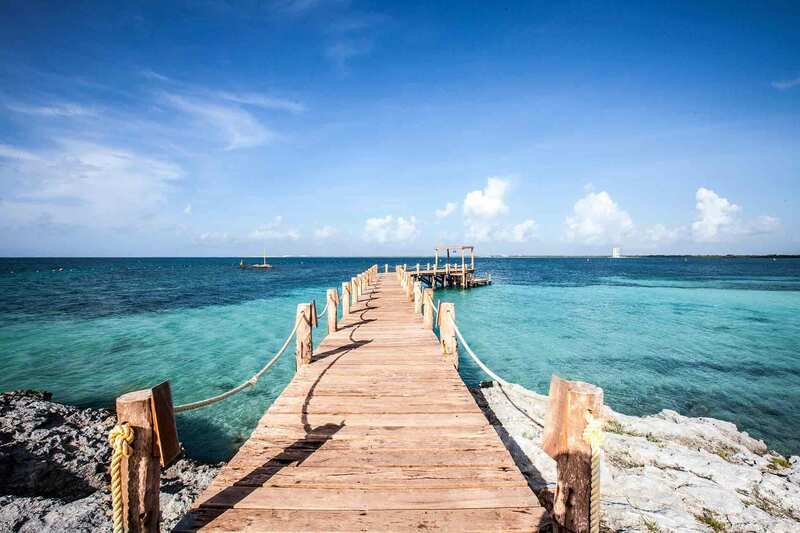 But the lure of the region’s stunning turquoise and impossibly clear Caribbean sea, white sand beaches and Mayan culture is just too much for us to keep away for long. 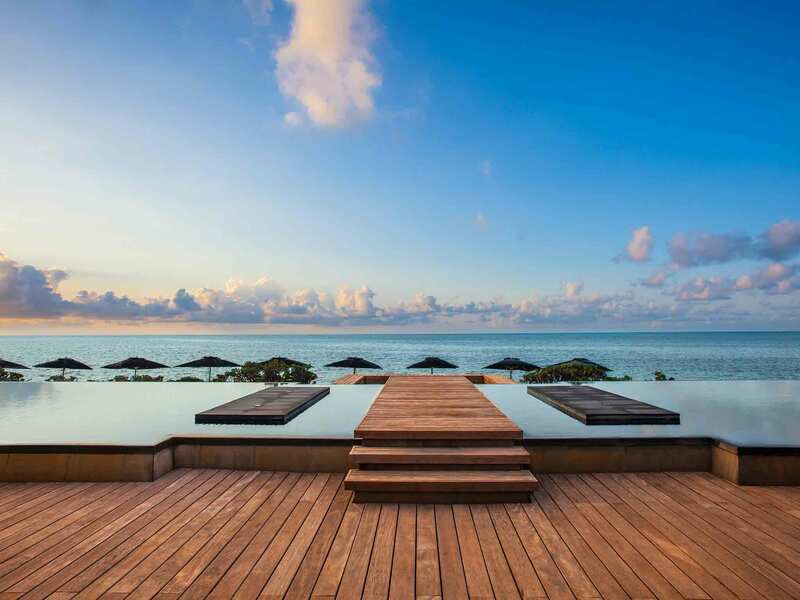 A number of high-end, escapist options have emerged, intent on reimagining the Cancún experience to cater to the tastes of the more sophisticated traveller. Among the very best is Nizuc. When the resort opened just a few years ago, it was immediately apparent that it was a game changer. it had illustrious beginnings, formerly a retreat of Mexican presidents (who kept the most pristine and secluded part of the Yucatan peninsula to themselves). When it came into private hands, architect Alejandro Escudero was tasked with the job, after all he had a reputation for creating Mexico’s greatest haciendas and homes. Our arrival was met with a little hiccup. Security was being very thorough and the taxi in front of us couldn’t get past the gatehouse. While fiery Latino temperaments ensued in front of us, we enjoyed the resort’s limo and chatted to the driver who met us at the airport, just 15 minutes away. Gated resorts have become a thing in the world today, particularly in more volatile destinations, but it’s odd to have it here in relatively safe Mexico, apart from the justified paranoia that the Mexican elite have about kidnappings. But not allowing everyone to walk in and out of the place certainly ups the exclusivity. We quizzed our driver on the a-list clientele he has picked up. As discretion is drilled into everyone here, he didn’t say, but we’re told that he has had his fair share of international sporting figures and movie stars. On entering, we understood why. Escudero has delivered a huge slice of paradise. We would instinctively describe it as a piece of Bali, or Thailand, in Mexico as there’s somewhat of an Asian influence to the design philosophy: maximising the interior’s connection to the ocean beyond, the double height, floor-to-ceiling shutters and the outside-inside, ‘open to the elements’ feel. Rustic dark-wood décor flowed into fire-pits, and endless pools of water led to infinity views. it did everything to play into our obsession with Feng Shui. But unlike in Asia, there were no clasp-handed hostesses with scented wet towels and welcome refreshments here. Check-in was satisfactorily efficient and simple. There is one softer custom the team has adopted, a legacy from the hotel’s first general manager. They all hold their right hand to their heart when they greet you, a lovely touch that after three nights I was doing myself. It’s not a Mayan thing, but actually a tradition from Malaysia. It means that every human interaction is taken to heart. Perhaps the understated check-in was so as not to overshadow what was to come – our sumptuous ocean suite. Just under a thousand square feet, taking nods from the lobby’s positive, open-plan flow of energy, it came complete with rustic, but gorgeous décor, an enormous bed and huge sliding doors that allowed us to wake up to the resort’s biggest geographical selling point: the sea. What really captivated us was the suite’s private sun terrace, pretty much the same size as the room again. Here we soaked up the sun in private whilst still being able to experience the buzzy feel of the resort, with the beach just below and the resort’s signature, black swimming pool and swim-up bar in the distance. in fact, the ocean suite is not the highest of the property’s room classes, there are also residences and private villas with infinity plunge pools for the real braggarts among us. The resort’s spa, ESPA is a complex of gorgeous villas and pools designed to take you away from it all. We’ll go on record to put this one down as one of the best hotel spas we have ever visited. its famous hydrotherapy ritual, where we were guided by the team through searing hot and icy cold experiences, followed by a pounding by water jets in a hydro-pool, had us feeling relaxed before even beginning our sublime massages. Nizuc is also a place that ensured we never went hungry, with six world-class restaurants. Breakfast each day was a feast as was the very zen, pan-asian dining experience in Indochine (where the Massaman Lamb is to die for). La Punta Grill that flanks the intimate adult pool is also wonderful for its views (and fried octopus ceviche). But our gastronomic highlight was its fine-dining restaurant Ramona, where we celebrated our last night. Young chef José Meza cooked up a delicious tasting menu with a contemporary take on old-school Mexican cuisine. The beautiful presentation and explosion of flavours was matched by the chef’s passion, but also by the way the servers told stories of how their own families would serve this sort of food at home. Looking out to sea at the dimly lit pier that night reminded me of our spellbinding snorkelling trip we took out to Musa, just metres from the hotel beach. Punta Nizuc is home to the Mesoamerican reef, full of wonderful coral and fish, but also the Museo Subacuático de arte (Musa), an underwater sculpture garden. 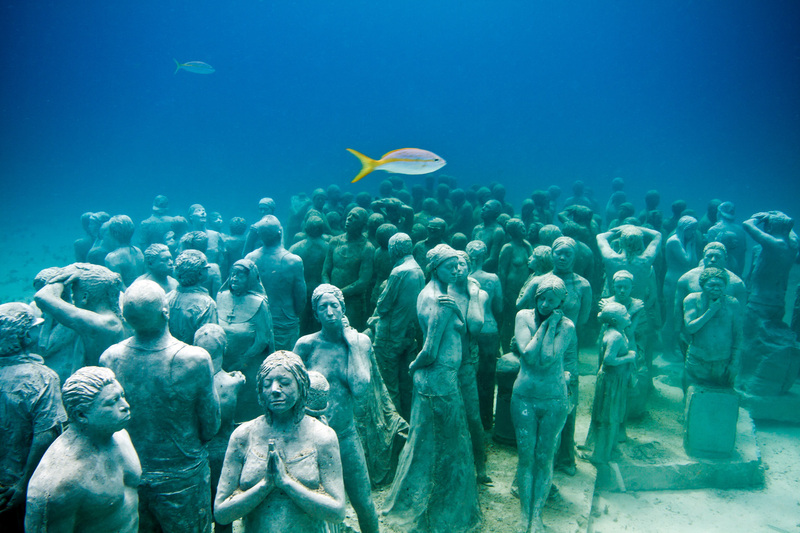 Today Musa consists of over 500 permanent, life-size monuments, specially commissioned by the project and one of the largest, most ambitious artificial reef attractions in the world. While the water shimmers an emerald green from the hotel, out there it’s crystal clear, so snorkelling is a dream.